A “snorkeling set” is an essential item in enjoying snorkeling. There are a lot of products available from brands like tusa or Thenice, and those that come with fins or none. 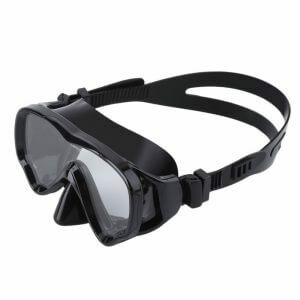 There are snorkels that have a purge valve, or twin lens mask, with so many things to take into consideration, it can be a bit confusing to choose the perfect one for you. 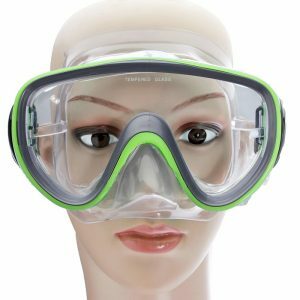 We will explain here the pointers in choosing a snorkeling set, and show you the top items that can be purchased online in rank order. We will also discuss the pointers in choosing the best item for your kids, please use this as a reference in choosing the perfect gear for the whole family to enjoy your snorkeling trip! 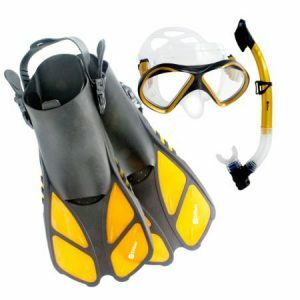 It is important thing about a snorkeling set is choosing items like mask, snorkel, or fins, that matches your own body. We will explain in detail the pointers in choosing the perfect item for you, make sure you read the article until the end. There are 2 types of snorkeling set: the three-item set that contains a mask, a snorkel, and pair of fins; and the two-item set that has a mask and a snorkel. 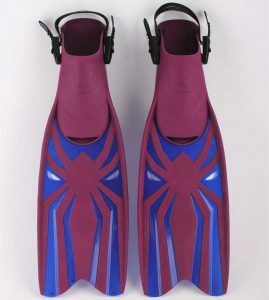 The set that has fins has everything you need in snorkeling and can be more appealing to beginners, but the fin’s size is already fixed most of the time so there is a possibility that it won’t fit your feet. Especially when you will buy a set for your kids, then we would recommend you to buy an adjustable fin separately and buy the two-item snorkeling set. To achieve a clear sight even when underwater, remember the below pointers when choosing your mask. You need to make sure that the mask you will purchase will fit your face perfectly. If there is even a little gap between your face and the mask, the water can easily come in. If possible, try on the mask without the strap when you’re in a store, inhale lightly through your nose, and check if the mask won’t fall off. The size of a person’s face is always different from one person to the other, hence you would need to check the fit by trying them on. We highly recommend you to go to a physical store first and try them on, before your purchase. You can hugely categorize snorkeling masks into 2 types: single lens and double lens. the single lens has no partition in the middle, giving you a broader view compared to double lens masks. It is also easier to see the facial expressions of the user, making it perfect for those who want to take pictures while snorkeling. Although you can’t put ｙo single lens masks, so we can’t recommend it to people with poor eyesight. You can use a graded lens for the double lens type, highly recommended to those with poor eyesight. Double lens masks are also relatively smaller, so that’s a plus too! Though the downside is its partition at the center, so the view is narrower than the single lens type. There are also items with lenses at the sides for a broader view, be sure to check that out as well. A snorkel will let you breathe underwater, making it important for you to check all the details like the pipe thickness and the mouthpiece size. Make sure to check them closely and choose the perfect one for you. You need to choose your snorkel’s pipe size based on your lung capacity. The thicker the pipe, the stronger the air pressure that is needed to eliminate water during “snorkel clear”. Hence, choosing a pipe size that matches your lung capacity is very important. Approximately, it is more or less 18 mm for adults, and 16 mm for children. For petite ladies with lesser lung capacity, you may want to opt for kids’ snorkels with smaller pipe size. A mouthpiece that is too big for your mouth is tiresome esp. if you need to wear it for hours. A size that is too small is also not advisable as the water can easily come in through the space. The most common mouthpiece size is more or less 50 mm, but if you think your mouth is relatively smaller, it is safer to choose the women’s snorkel or kids’ snorkel. The difference between the snorkel with purge valve and snorkel without the purge valve, is with the ease of doing a snorkel clear. If there is a purge valve, it will eliminate the water inside your snorkel and prevent them from coming back in. It will also help reduce the water pressure, for easier and more effortless snorkel clear. Kids and beginners, as well as those who have low lung capacity should opt for snorkels with purge valve. There also products with dry top or dry valve, that prevents water getting inside your snorkel from the top of the pipe. It will lessen the possibility of the user from drinking the water that comes in the snorkel, for a safer snorkeling experience even for beginners. Lastly, a fin that will let you swim smoothly underwater just by attaching it to your feet. How would you choose the perfect pair? 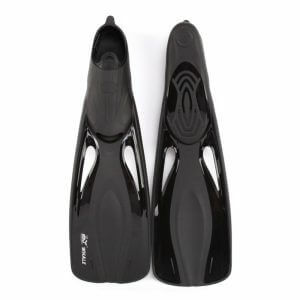 There are two types of fins: the full foot type and the strap type. The full foot type will cover your whole foot up to your heels, and will perfectly fit on your feet. It will feel like a part of your feet, and is easier to control. Though you can’t adjust its size, so you need to be careful in choosing the perfect size for you. The strap type on the other hand can be adjusted freely, and very easy to put on. The most common way to use it is to wear it on top of marine shoes. If you plan to share one fin with your family and friends, or you are looking fins for kids with growing feet size, then you should opt for the strap type. Longer fin (blade), with harder material will give you more acceleration underwater, but will require more strength from your legs to control it, because the water resistance is stronger. If you are not comfortable with your leg strength and or swimming skills, then choosing a smaller blade with soft rubber material is highly recommended. 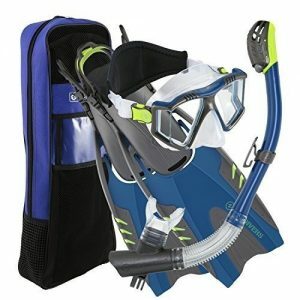 Now we will show you the top snorkeling sets for adults and kids in rank order. 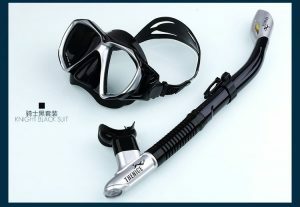 Let us start with the adult’s snorkeling set first, and choose the product that is perfect for you. This product is made in Italy that guarantees high-quality materials used and has an easy-to-adjust strap to help it fit perfectly onto your face’s surface. The frame is a little bit smaller than the regular and more common masks, so if you’ve been having a hard time finding the perfect fit mask for you because you have a small face, this might be the product for you! We highly recommend this product to people with poor eyesight, as it has a lens card slot with it. You only need a new lens to change the grade without the need to replace the whole mask. 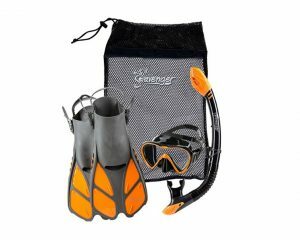 If you have a plan to share a snorkeling set with your family or friends and some of them have poor eyesight, then this set will be the best choice for you. The snorkel itself has a dry top with floating ball that will prevent the water from going inside the snorkel pipe whenever the tip goes underwater. This product has reviews that commented on how well it fits their face, because of the very soft rubber material that is used as its mask skirts. 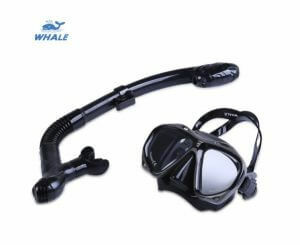 It is a good choice for those who want to enjoy snorkel for long hours since its soft rubber gives you nice comfortability. The mask uses a tempered glass that shatters into small pieces when broken to avoid any major injuries. It is easy to bring this product along too as it comes with a net bag for the snorkel for easier drying and a plastic case for the mask for protection. Enjoy Panoramic View with This! This product has a wide panoramic view single lens mask so you can enjoy the ocean view to the fullest, without any partition to block your view. Not only that, the mask uses a high quality tempered glass in an inverted teardrop shape to bring the lens as close to your pupils as possible for a natural view of the ocean. 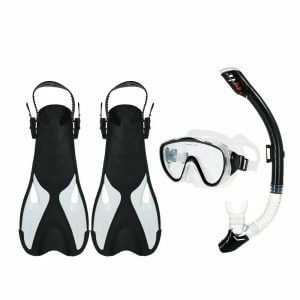 Since the fins are short and agile, this set is recommended for snorkeling beginners. The size of the fin also makes it easy to carry while traveling. You can keep all three items in the plastic mesh bag that comes with it, where they dry up quickly. 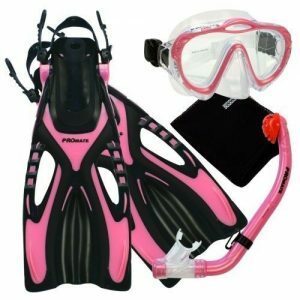 This product has all the factors that you want in a snorkeling set and more. It has a 4 window mask to give you the broadest view to enjoy your snorkeling experience to the fullest, while being able to record them with your go pro, mounted securely to the snorkel. The bonus part is it comes with a bag where you can securely store them and transport them. We highly recommend this to everyone who wants to maximize their snorkeling experience. Let us move on to kids’ snorkeling set. Hope you could find the perfect product for your kids! This product is highly recommended for kids ages 8 and above and can be shared too with the mother if the mother is petite. The extra soft thermoplastic rubber makes it comfortable for a wider range of users even if it’s a full foot type, though the blades are a bit hard to control as per the reviews. 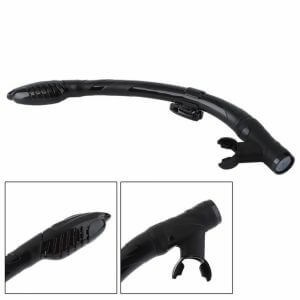 Although this may not be the item you would want if you are looking for something to use for a longer use, we recommend this product for those who are looking for a cheap snorkeling set that you can use for an occasional trip. 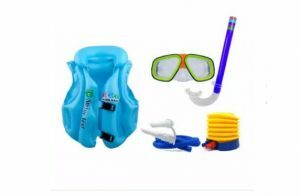 This snorkeling set is highly recommended for those who have kids who can’t swim yet, as it comes with an inflatable vest. It also comes with an air pump that you can use with the vest, or with your other inflatables. All three items with just ₱899! 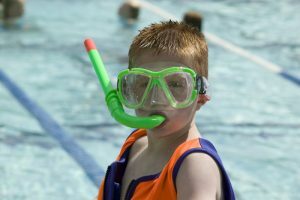 The snorkel has no dry valve or purge valve, so it may not be safe to use in beaches with higher waves, but is good enough for your kids to enjoy the water in pools or quiet beaches. It can be a great gift for your nieces and nephews too! This product has its priority on giving your kid the clearest, and wide view of the ocean during their snorkeling experience, from its one window design to its lens shape, and the anti-fog treatment done to its tempered glass. The mask and the mouthpiece use high-grade silicone to comfortably fit your kid’s face and mouth perfectly. 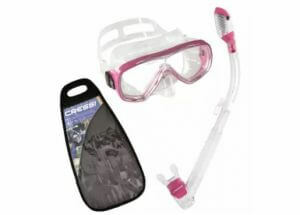 With its anti-fog feature and comfortability, it is highly recommended for children who like to snorkel for long hours. The fins of this set have a lot of commendations on how it is soft and very comfortable to wear, even if it is a strap type adjustable fin. The fins have shorter blades compared to other products too, making it more lightweight and easier to control, perfect for snorkeling beginners. The mask is a double tempered glass lens, for clearer fog-free under ocean view, and it prevents scratches as well. 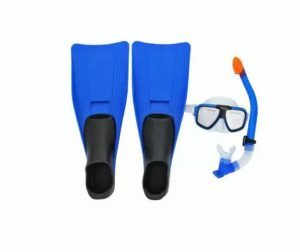 This set is highly recommended for kids who do snorkeling with fins for the first time because of the short length of its fins. This product is something that your kids can wear and remove on their own. If your kid is also into scuba diving, this is the perfect product for you as the mask’s nose has a dimple on both its sides to hug the nose a little tightly for easier equalization during scuba dives. This comes with a mesh bag for easier storage and transport during your beach trips. They also have different sizes to match a different age group, if you have children with big age gaps. 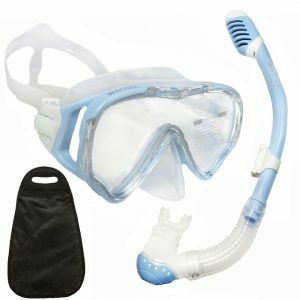 We just finished introducing to you the top snorkeling sets, how was the list? Snorkeling is a fun beach activity that can be enjoyed by practically everyone! Hope you can find the item that you can use safely and easily, and keep the new knowledge in mind to enjoy your beach trip to the fullest!